Today I've got a fun card to share with you using A & M Memories Designs Butterfly Betsy image. I colored her in using Copic markers then applied fluid mask in order create the background with distressed inks. The fluid mask took a while to dry but makes it easier to create the background. 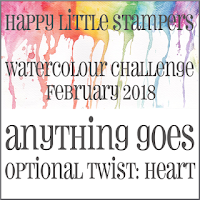 After the background was done, I added splatters of black distress ink to the background and whites dots to highlight the image. I die cut the image out with a stitched circle die and trimmed off the outer edge to remove the stitching lines. I freehand the banner for the sentiment and popped everything up with foam tape. Visit the A & M Memories shop and use my discount code: KIMS15 to receive 15% off your purchase. So cute! Love you card! 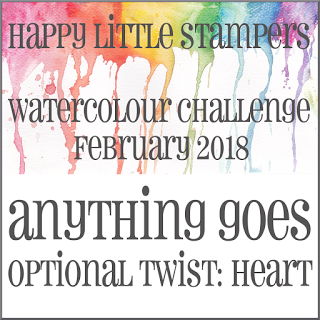 Thanks so much for joining us this month at Happy Little Stampers Watercolor Challenge!